Millions of people suffer from incontinence and urine wetting problems. Both young and old commonly experience incontinence episodes, and early detection is important to ensure that hygiene and good health are maintained. Our team of experts developed the Wet-Detective and other bedwetting products with comfort and care in mind. We want to provide the most affordable, best quality, and results-oriented products and education. The Wet-Detective™ Wetness Alert System is bringing state-of-the-art technology to bedwetting alarms. Incontinence is a serious issue, and now the solution is at hand: The Wet-Detective™. This sensor pad and alarm unit system is ideal for aging adults, those with special needs, and the people who take care of them. 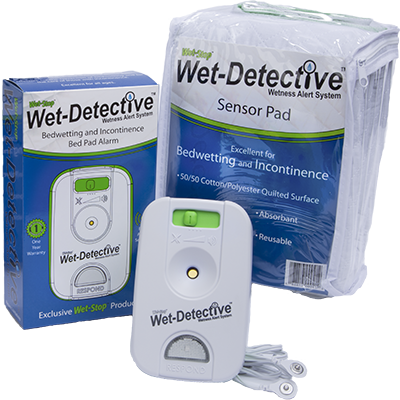 The Wet-Detective™ alarm and patented bed pad system was created for incontinence management and care. Simply place the waterproof and washable pad, connected to the alarm unit, on top of the chair or bed on which the individual will sit or lie. When the pad becomes wet, a silent light and soft beep or alarm notify caregivers that the pad is wet and care is needed. The Wet-Detective™ allows a person with incontinence problems to wear their normal clothes and avoid diapers. The Wet-Detective™ also helps care providers know when care is needed. This leads to improved sanitary conditions for those suffering from incontinence, preventing disease and other health-related problems that can be caused by lying or sitting on a wet pad for extended periods of time.